If you only have a day or two to see some highlights in Vietnam’s biggest city, close your eyes and hang on tight. That’s because you’ll likely be on the back of a little motor scooter zipping through the narrow streets and crowded alleyways of Ho Chi Minh City. Ho Chi Minh City (the locals still call it Saigon) boasts a metro population of more than 13 million, including about seven million scooters. It’s possible to take a cab, but it’s more expensive and it takes longer than to hail a ride or book a tour on a scooter. One of my classmates, Steve Mason, is a professional photographer and has posted many of his images of Vietnam on Facebook and Instagram. Seeing these images made me want more information about Vietnam. The online visa application is inexpensive: about $42, including “express” service for on-arrival visa. Then, there’s a $25 “stamping fee,” which you have to pay in cash. At Ho Chi Minh City airport, I purchased a taxi to my downtown hotel at a tour desk in the airport. It took about 35 minutes to go 10 miles — and that’s where I saw my first never-ending swarm of scooters. Mason’s local contacts advised me to download the “Grab” app on iPhone or Android. Grab is the “Uber” of Vietnam. You can’t miss the green helmets—which stand out nicely in the vast sea of scooters. After getting a SIM card from Vietnamobile for about $4 (plenty of data and voice, but no hotspot), I booked a food tour via scooter on “Saigon on Bikes." Was I a bit nervous? Yes. Did I get over it? Barely. But if you want to cover some ground in Vietnam, you need to go by scooter! Our lead guide, Pumba, gave me a good safety briefing: “Always get on the scooter from the left, so you don’t burn your leg on the muffler.” Then, he adjusted my helmet and introduced me to Huong, who drove the scooter. Her scooter had a name, “Elizabeth.” Huong was half my size and a third my age. The scooter was easy to straddle, but I had my doubts this young 20-something could navigate the crazy streets of Saigon. I held my breath and she hit the gas. After a few moments, I opened my eyes as we were swimming in a river of scooters. There were three or four people on many of the scooters. Some were hauling loads that were bigger than the bikes themselves. It was a mad ballet where scooters and cars and buses were moving in different directions. The pedestrians had special status — but had to move with intention to cross any street, irrespective of green or red lights. He returned with a delicious green mango salad with some shrimp chips and sweet-hot Sriracha-like dressing. “This lady has been selling the salad streetside for 30 years,” said Pumba. “She’s right outside the Nike store across the street,” he said, pointing to the distinctive Nike swoosh logo. It was a great way to start a day of exploring and eating in Vietnam’s largest city. Other stops included do-it-yourself spring rolls, including pork sausage, pickled cabbage, raw mango and beef grilled with lemongrass. My adventure-meter had red-lined earlier when Huong made a left turn into the oncoming traffic. What could be more adventuresome than that? “Sure,” I muttered. 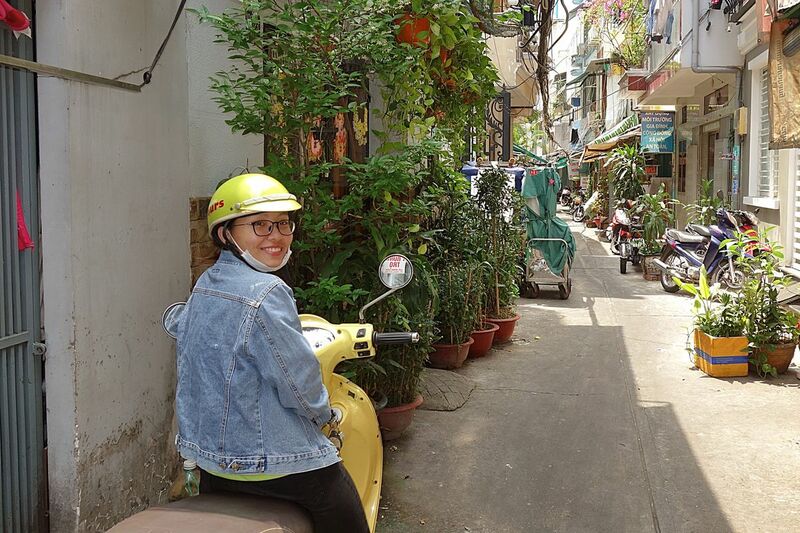 After about 10 minutes on the main thoroughfare, Huong turned into a narrow alleyway and slowed down as we picked our way through the low-hanging canopies. Finally, we rolled up to a narrow storefront and she stopped Elizabeth. “Do you like eggs?” she asked. Eggs? Sure. Earlier I had enjoyed a rooftop breakfast at the Hotel Majestic, overlooking the Saigon River. They had an omelet bar, along with noodle soup and cold cuts for the international travelers that have stayed there since it opened in 1925. Pumba was waiting for us inside, holding an egg. “This is Saigon soul food,” he said. He was preparing “balut” for me. It’s the partially-formed baby duck that’s enjoyed all over southeast Asia, including the Philippines. I started to swoon and recalled seeing an episode of “Bizarre Foods” on balut. “Would you like a beer?” asked Pumba. Beer in hand, I picked away at the yolk and other parts of this Asian delicacy with care. Finally, I got to the heart of the matter and ate it. Surprisingly, it was pretty good. Then I ordered another beer. The other delicacies on the “soul food” platter are something of a blur: a large oyster cooked with Laughing Cow cheese, clams with noodles and a raw prawn dipped in wasabi. “We just stop at a shady street and text this lady, who comes over to greet us and make an iced coffee or juice,” she said. Right on cue, a scooter appeared around the corner. 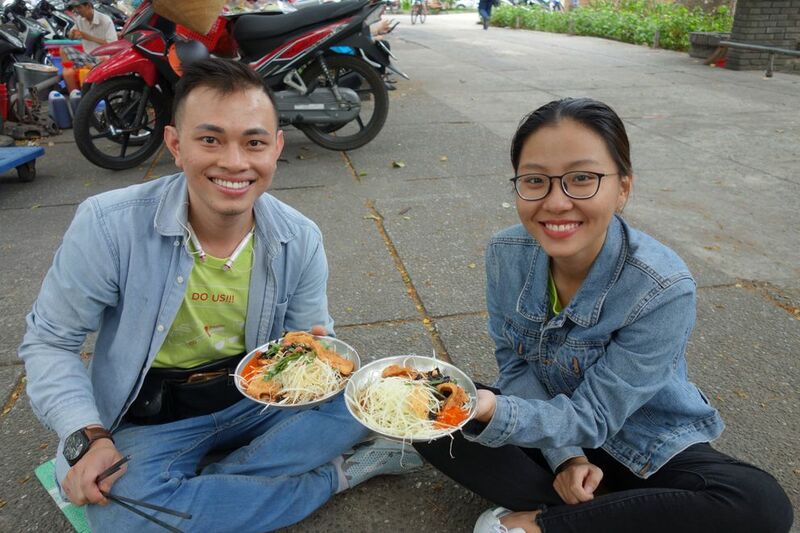 “We use beans as a sweet dish here in Vietnam,” said Pumba. Sure enough, the red beans were served up in chilled coconut milk and it was a nice finish to my version of “Bizarre Foods” in Saigon. The motorbike food tours start at $59. Since I was just in Saigon for the day, I opted for the “Saigon Xplorer” tour for $95, which included stops at local landmarks, some history and commentary.